More than 20.000 people came to Cologne, Germany, yesterday to protest against the Turkish military aggression in Afrin, Rojava. But the demo was stopped by riot cops because people were waving flags with a portrait of Abdullah Öcalan, one of the founders of the PKK, an organisation that is banned in Germany since 1993. Read all our reports about Defend Afrin; here. Yesterdays demonstration started to march with a delay of about an hour. The cops did not allow the demo to start because people were carrying flags, vests and t-shirts with portaits of Öcalan. There were also many YPG flags but the cops allowed these flags in Cologne. Although the YPJ and YPG fought ISIS in Rojava, their flags are banned in Germany since March 2017. After questions about the ban in German parliament, the German federal government said that the YPJ and YPG flags are not banned as such but when they are used as an alternative for banned PKK symbols. The demo marched a few hundred meters when the cops stopped the demo and kettled two groups of the demo. One in the middle and one at the back of the demo. The front group was also blocked by riot cops and water cannons. Behind the kettle of the middle group, people from the anti-authoritarian group formed a chain between the riot cops and a group of protesters with many families. The situation was tense but the protesters remained calm after this act of authoritarian state behaviour. The stalemate continued for several hours. At the end the cops decided to ban the demo (which was peaceful when the cops ended the demo) and people returned to the starting point at Ebertplatz in Cologne. In a press release the cops later stated that they ended the demonstration because of the Öcalan flags. At Ebertplatz things escalated a bit after cops detained a boy who was allegedly carriyng an Öcalan flag. An elderly man tried to discuss the detention with one of the riot cops. The riot cop from the infamous riot squad (aways good for an escalation) from Wuppertal (Germany) started to hit the old man and after that things got rough. People were furious about this violent attack by the cop and a few objects and firecrackers were thrown to the riot cops who assisted the cop that started the attack. 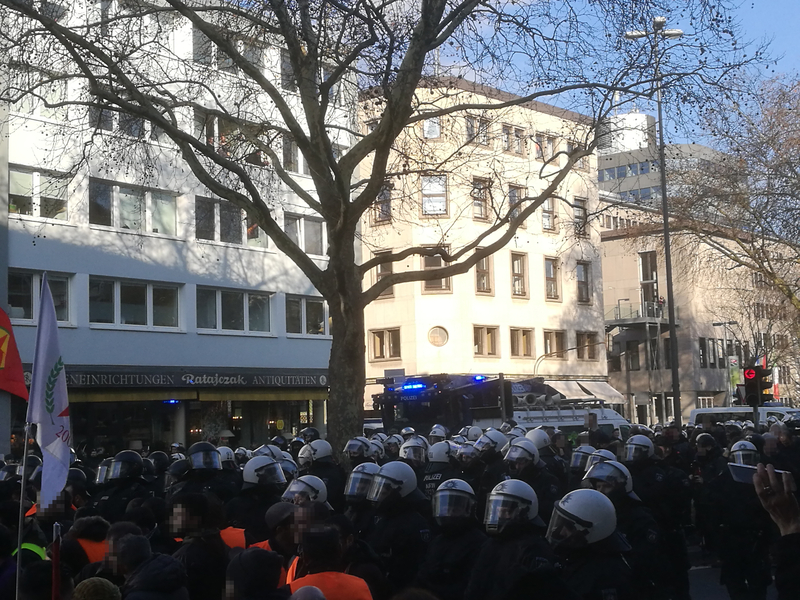 The skirmishes didn’t last long, hundreds of riot cops came to reinforce the cops that were already there and cleared Ebertplatz with the use of pepper spray and batons. Once again the German state assisted Erdogan’s authoritarian and violent Turkish state. The German government is not only again and again approving the export of arms to Turkey by German companies, it seems that the German state is willing to do almost everything Erdogan wants them to do to as long as the Turkish state is complying with the EU-Turkey deal which was designed to keep refugees out of the European Union. The latest arms deal of German manufacturer Rheinmetall is put on hold, but the question is for how long? German foreign minister, Siegmar Gabriel (SPD), said that the “new” government will have to take a decision about the deal. German social democrats (SPD) and Merkel’s CDU are negotiating to form a new government at the moment and the decision to put on hold the approvement of the new arms deal by the German government could be a tactic to buy time. Once the media attention of the Turkish military aggression against Rojava weakens the German government could try to use the momentum to approve the deal. This wasn’t the first demo that wasn’t allowed to march in Germany. Since Blockuy 2012 in Frankfurt (were about 1000 people were kettled for hours), the Rote Flora demo in Hamburg in 2013, and more recently the camps and the “Welcome to Hell” demo during the NoG20 protests in Hamburg, it seems that “bigger” demonstrations of the radical left are not allowed to march in Germany anymore. We will have to find an answer to this tactic by state authorities. Cops Remove Solidarity with #Afrin Banner, #YPJ and #YPG Flags at Rote Flora in #Hamburg – Enough is Enough! Cops Banned #DefendAfrin Demo in #Dortmund #Germany – Enough is Enough! #Afrin Attacked With Vehicles and Weapons Made in #Germany – Enough is Enough! #Germany: Cops Banned Demos in Solidarity with #Afrin in #Cologne and #Duisburg. Come to #Wuppertal! – Enough is Enough! Reportback: Demo in Solidarity with #Afrin & for the Freedom of #Öcalan in #Strasbourg – Enough is Enough!